Confession: I always feel… um… awkward… when I pass a homeless person on the street. I never know what to do. Do I ignore them? Then I feel like a huge jerk. Do I make eye contact and say hello? I still feel like a jerk. Oh wait. Maybe its not awkward. And maybe it’s not just feeling like a jerk. Maybe it’s conviction. Like, from the Holy Spirit. As in I should do something about it. But I haven’t really known what to do before. Until last week. I knew what I had to do, and I was certain it was from God for several reasons. First, the bucket list epiphany from the day before. Plus, I almost never carry cash, but it was the beginning of the month and I knew our full “entertainment/eating out” money of $75 was tucked snugly in an envelope in my purse. I continued to pray for God to make it clear what and how to do this. I wasn’t sure where (or IF I was going!) to turn, but at the next stop light, I spotted him… and the left turn lane was wide open. I rolled down my window and beckoned to the man holding the cardboard sign. 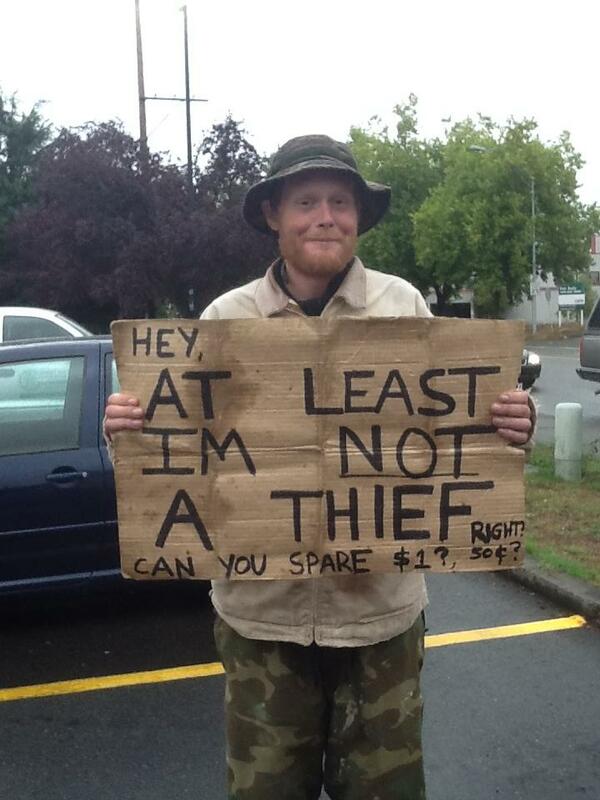 I gave him my wad of cash totaling $125. He smiled gently and his eyes filled up with tears. He didn’t stop to count it but slowly just shoved it into his pocket. His name was James and we had a conversation about various prayer requests, specifically for healing and health of a muscle issue in his leg. As we talked, he just kept saying thank you, over and over. After a few moments, I told him we would be praying and that God was with him. I turned on my blinker, pulled out of the parking lot and waved goodbye. He waved back, gratitude filling his face. As I drove home, I was praising the Lord for His voice, faithfulness and generous spirit. Some skeptics might say that it was a reckless thing to do, giving a stranger, a homeless one at that, all of our family’s cash for the month. No, I can’t guarantee James will spend it responsibly. But what I can guarantee is that Jesus loved the least of these… the tax collectors, prostitutes, beggars, you name it. So why shouldn’t we do the same? We are called to recklessly love Christ. He loves James just as much as He loves you and me. Oh, and I absolutely don’t tell this story to brag… I my fleshy self never would have though of this on my own. But I share this account to inspire. It wasn’t me that handed over that wad of bills. It was Christ. In heart and spirit. How can you be more like Christ today? Think about it… And share your thoughts in the comment section below. My husband and I continue to pray for our new friend James… That while He might not have a home here on earth at the moment, he might someday have a permanent hopeful heavenly home. So this year, I want to share with you a little reminder and share with you what we did for our families this year for Christmas. Its edited and updated from a similar post this time last year… Hope it makes you think– and I would love your feedback. Comment below. It’s 5:45 am… I throw back the covers and my eyes pop open. It’s go time. There, in the gentle glow of Christmas lights are piles of presents. Santa showed up and he did not disappoint. I grab the nearest gift with my name on it and violently shake it. Nothing. Dang. It’s probably clothes. Socks. Maybe even underwear. Sigh. Admittedly, I have grown up and matured over the lasts couple of decades. I still love receiving the gifts, but now I love the family time even more… Especially since I am married to a soldier and our family is in a different time zone a thousand miles away. Yeah, we no longer take “family time” for granted! God designed my heart to give. I love giving presents and showering people with love, sometimes in the form of “stuff.” In the past at Christmas, I would go all out thinking, marinating, pondering strategerizing, and planning what I deemed were “perfect gifts.” And would typically make it happen- no matter how it impacted my Visa card. Two years ago for Christmas, my beloved suggested that we do something different and forego the hoopla of dropping wads of cash and buying presents. He suggested we give something perhaps more thoughtful like donating our money to a good cause. I flat-out told him NO. Absolutely not. Negative. Nada. So we went with the “traditional” gift giving. It was ok.
Then last year, things changed. Apparently God wanted to do a little bit of work on my heart… We put my hubby’s suggestion into action and gave gifts to our family in the form of a donation to a charity/cause that would mean something special to them with an accompanying letter explaining what we did. This year, things are even tighter, with me now working full-time for Jesus dollars and a new baby on the way. (Yay-yikes!) So we changed things up again this year… We spent some time praying for our family and listening to God– then gave them a framed message of what God spoke to us during that time. Today I want to encourage you that just because Christmas has passed for another year, doesn’t mean our Jesus heart of giving has to stop… God gave His son on the cross and that never runs out or expires. So as we approach 2013, how can you make it a year more about Christ through giving, prayer, love or small acts of kindness? Dear friends, Christmas is one day… But we can celebrate Christ-more all year long. Readers… we need your help. Remember the acts of kindness movement we do here at 7 Days Time called Factor of 7? You know, the whole thing about us randomly sharing Jesus’ love in unique and unexpected ways? Well, 2012 has been an awesome year of giving, loving and praying… but 2013 is sneaking up on us! We would love your ideas and input for any creative ideas for 2013 Factor of 7 movements. Heaven is the limit. (Literally.) Anything goes. Maybe it’s something you’ve heard of, thought about, dreamt of, or experienced yourself. Get creative. Leave your suggestions by commenting below. $7 because we all have 7 days time to live each week… and $100 because God loves you more than you can imagine! Joy for Joyce— we took $107 in an envelope and went to a local grocery story. After walking around and praying for a few minutes, we gave our envelope of cash to a woman, telling her we wanted to help pay for her groceries. Chill with Jesus-– My beloved husband and I went to our local frozen yogurt shop and paid for 35 unsuspecting customer’s fro-yo (approximately $107) asking nothing more than how we could pray for them. A Latte Love-– Just like our fro-yo experience, we did the same thing at Fort Benning’s Starbucks for 22 customers. Oh, and we made the Fort Benning Bayonet… we were able to reach so many people to tell them about Jesus’ love! Bravocado, Jesus! In this Factor of 7 experience, God took a moment of potential pity and grumpiness, and allowed us to bless our waitress at Chili’s with a pretty hefty tip. Way to show up, Lord! How Sweet It Is— We mixed things up a bit for this one… we baked lots of tasty goodies, then gave them to our “unsung servants” here at Fort Benning, from the housing office workers, to the garbage truck guys to the gate guards. Planting a Few Seeds of Faith— This experience allowed us to share even more about our Factor of 7 ministry movement during a teaching workshop at Seeds of Faith Youth Group in Lester, IA… Then we were able to bless and pray for the participants. We give God ALL of the glory for each of these experiences (as well as the undocumented ones we have done in order to protect people’s privacy.) We are so excited for all God has in store for us in 2013– and can’t wait to hear about the awesome ideas that you share below. Thanks for your support and prayers this year… YOU have blessed us immensely. It is the season for giving… So for the month of December, I am excited to introduce a new series called “Friday Focus.” Since Five Minute Friday is taking a holiday hiatus, God has encouraged me to showcase some faithful folks who are living in obedience, promoting His message in unique ways. Our first Friday Focus Feature comes from a former client (and now friend!) of mine named Aribel. This woman has experienced God’s power in mighty ways throughout her life, but most recently as a breast cancer survivor. She has taken Romans 8:28 (“And we know that in all things God works for the good of those who love him, who have been called according to his purpose”) to heart. My name is Aribel Del Carmen Leon Parris. I am a breast cancer survivor. During a visit to the doctor’s office, I became personally acquainted with this deadly threat. I will not deny the diagnosis felt like a death sentence. I was engulfed under a wave of so many emotions and found myself at a loss for words. I was completely clueless about breast cancer and was desperate for answers. I did not know anyone who had undergone the experience. I was in a daze. It was like a bad dream. I had many late night vigils, but I did not have the courage to call anyone at three o’clock in the morning to voice my fears. I was unable to put into words all the emotions that were welling up from within. My heart ached. Day in and day out, I would mentally pose the question to God, wondering if I was going to die. I was in my apartment with my thoughts feeling very much alone. I would find myself consistently awakened during the early hours of the morning communing with God, though it felt like He was miles away. But then I finally understood He was there, all the while. Jehovah Shammah means “The Lord is There” in Hebrew. I will never forget the sweetness of those early morning encounters. Later I felt inspired to pick up a paintbrush, never having a sense of direction regarding the outcome. I started painting around the time I discovered an inflammation on my left breast and I continued to paint throughout my treatments. I never imagined that they would attract an audience or that my breast cancer journey would unfold in such an unexpected manner. It was my physician who encouraged me to showcase the artwork. I was very reluctant to come forward. The last thing I wanted was to be thrust before an audience. I could not see how the paintings warranted a reception and neither did I have any formal training in art. The artwork unfolded during such a dark period in my life while I was battling depression and the obvious possibility of my life coming to an end. While undergoing my treatments, I met “Gail” and “Patty” who were at different stages in their breast cancer journey. We were rooting for each others’ recovery. Our last words were words of encouragement. Soon after, I received the agonizing news of their passing within a short period. It was heartbreaking. I pay tribute to their memory and how our individual experiences do not detract from our journey. Each season has added to the development of this artistic journey, coming together piece by piece, like a jigsaw puzzle. Today I release the artwork for its intended purpose and take a bold leap of faith. I render glory and praise to God who takes the broken pieces, challenges, and painful experiences of my life, and gives me Hope through Him. The hymn entitled, “Because He Lives,” by William and Gloria Gaither and “My Redeemer Lives,” by Nicole C. Mullen have special meaning to me. I know because Jesus Lives, I can face uncertain days. This is my testimony. So if you are still searching for the perfect Christmas gift, I encourage you to purchase a calendar or a piece of art– especially if you or someone you know has battled breast cancer. A portion of the profits will benefit non-profit breast cancer charities. To check out the artwork, pop over to Aribel’s website or click here to order a calendar. It is a true blessing to be a part of Aribel’s mission… I am thankful that God has brought us together in our walk with Christ, and I couldn’t be more grateful for how her testimony continually speaks to my heart! It is the season for giving– Aribel has given her life to following Christ… Now won’t you help her walk with Him? PS: Just in case you were curious– I didn’t receive any compensation or bling or whatever for featuring Aribel. I asked if I could share her story because I believe so deeply in her mission! God is doing GREAT things through her– and I’m blessed to be a part of it!